Veranda Suite Upgrades will consist of Veranda for Ocean View or two or three category Veranda Suite upgrades. Shipboard Credits are applicable to Penthouse & Premium Suites and are on a per Suite basis. All offers are available on select 2019 and 2020 sailings when you book between Tuesday, 23 April 2019 until Friday, 31 May 2019. Your home away from home is a superbly appointed luxury suite. Here, you can revel in sublime comfort as the world passes by. The sea is always in view, framed by the expanse of a five-foot picture window or the doors of your balcony or verandah. Fine Egyptian cotton linens, a fluffy duvet and king-sized down and feather pillows encourage the indulgence of afternoon naps. Sunshine enters your suite each day in the form of your personal suite stewardess. Seabourn’s award-winning cuisine starts with the finest quality ingredients, infused with authentic regional flavours, prepared à la minute by their skilled chefs and served with pride. Each Seabourn ship offers a choice of dining venues to suit your mood of the moment, and nearly all are open-seating, inviting you to dine where, when and with whom you wish. A new partnership with multi-Michelin star American chef Thomas Keller brings a new alternative restaurant "The Grill by Thomas Keller", already onboard Seabourn Quest and being rolled out fleet-wide. There is no supplement to dine at any Seabourn restaurants, while wines are included. 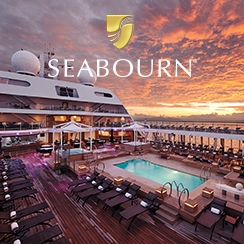 Ventures by Seabourn” tours by Kayak and Zodiac explore natural wonders in Antarctica, Alaska, Northern Europe and even the Amazon, all led by Seabourn’s experienced expedition teams.